Drum Point Lighthouse – Chesapeake Chapter U.S.L.H.S. Drum Point Lighthouse was originally located along the western shore of the Chesapeake Bay at the northern side of the mouth of the Patuxent River. Efforts to place a light at this location began in the 1850’s due to the need for a light to mark the location of shoals around the point. Disputes between the State of Maryland and the federal government over the property were a factor in preventing construction of a lighthouse during that time period. By 1874, at the urging of numerous steamship companies for a light to mark this location, the Maryland General Assembly passed an act of cession allowing the United States government to purchase land and empowering the governor to convey submarine land. In 1882 an appropriation of money was made and an off-shore lot obtained in 1883. Construction of the lighthouse was achieved by prefabrication elsewhere and barging the parts to the site. The lighthouse is a white, 46 foot tall, 1½ story hexagonal screw-pile cottage. It is one of only three screw-pile design lighthouses still existing on the Bay. The lantern room has a pyramidal roof capped by a ventilator ball. The lighthouse was commissioned August 20, 1883 and exhibited a fourth-order Fresnel lens. The lighthouse was built off-shore in ten feet of water. Over the years silting slowly brought the land toward the lighthouse. Around the turn of the last century it was possible to build a foot bridge from the shore to the lighthouse. This allowed the keeper to move his family in with him on the lighthouse. By the 1970’s the shoreline had enveloped the lighthouse. The original light was a fixed red light and visible 13 nautical miles in clear weather. This changed in 1911 to a fixed white light with red sectors. A fog bell was present for poor visibility conditions. The light was converted to electricity in 1944 and was automated in 1960. The lighthouse was decommissioned in 1962, being replaced by a lighted buoy, and then a fixed off-shore light. Neglect and senseless vandalism, including several fires, caused considerable damage to the vacant lighthouse over the next decade. In 1974 the Calvert County Historical Society gained possession of the lighthouse, but not the land. 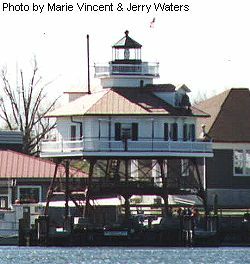 In 1975, with the provision of grants and the assistance of the B.F. Diamond Construction Company, the lighthouse was moved two miles to its current location at the Calvert Marine Museum, Solomons Island, MD. The lighthouse has been beautifully restored to its original appearance, due in part to the help of the daughter of the last keeper of the light. It is furnished with period antiques and is open to the public. It has become the waterfront’s main attraction and is listed on the National Register of Historic Places. The Drum Point Lighthouse is open year round, weather permitting, except for when the museum is closed on certain holidays (New Year’s Day, Thanksgiving Day and Christmas Day). Your admission fee for the museum also allows you to tour the lighthouse. Head Keepers: Benjamin M. Gray (1883 – 1890), William A. Bareford (1890 – 1891), James L. Weems (1891 – 1918), William Yeatman (1918 – 1919), Henry C. Wingate (1919 – 1922), Cale B. Stowe (1922 – 1924), William T. Midgtt (1924 – 1925), James W. Lewis (1925 – 1929), John Higbee (1929 – 1930), William M. Goeshy (1930 – 1931), John J. Daley (1931 – 1938), Gatha F. Gatte (1938), Walter J. Westcott (1938 – 1941), H.L. Matthews (1941 – 1942), F.S. Barnes (1942), John Werner Hansen (1942 – 1959), Earle Harris (at least 1952 – at least 1954), Raymond C. Frye (1959 – 1961), Harold E. Smith (1961 – 1962), Russell H. Levenski (1962). Starting from the Capital Beltway, Interstate 495-95, around Washington, DC. From Washington, D.C.: Take State Route 4 east from the Washington Beltway to State Route 2-4 to Solomons. Once in Solomons, stay in the right lane of Route 2-4. It will exit to Route 2, passing under the Thomas Johnson Bridge. Make a left, drive approximately 200 yards, and the museum will be right in front of you. From Baltimore: Take Interstate 97 south from the Baltimore Beltway, to State Route 3 and U.S. Route 301 south to State Route 4. Continue south/east to State Route 2-4 to Solomons. Once in Solomons, stay in the right lane of Route 2-4. It will exit to Route 2, passing under the Thomas Johnson Bridge. Make a left, drive approximately 200 yards, and the museum will be right in front of you.